We are proud to offer you the complete line of Eminence Organics...the highest quality 100% organic skin care products, used exclusively in fine salons and spas! With vitamin packed active ingredients and anti-oxidents this wonderful anti-aging skin care is made from the finest fresh fruits, herbs and flower buds. 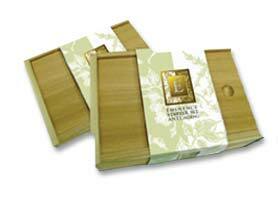 Once you experience the difference of Eminence Organics, you will never want to use anything else!
. : Jennifer Aniston Loves Eminence! :. 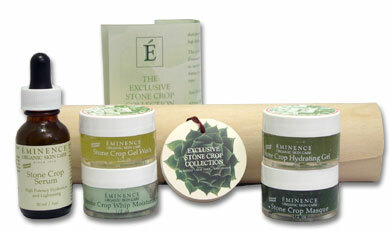 Rumor Has It - Movie Premier Eminence VIP Gift Bags! Jennifer Aniston and fellow co- stars, Kevin Costner, Shirley MacLaine and Mark Ruffalo plus 50 other A-List celebrities received Eminence VIP gift bags filled with Sun Defense Minerals and the Sugar Plum collection. Hollywood A-listers are "HOT" over Eminence Organics! 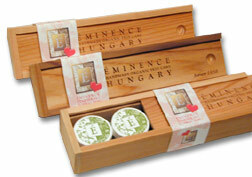 Description: Eminence is pleased to present all your favourite anti-aging products in one fabulous handmade wooden gift box. Active Ingredients: Lemon Cleanser, Almond and Mineral Treatment (Exfoliating), Eight Greens Phyto Masque (Balancing), Eight Greens Moisturizer (Moisturizing) and the Uplifting Eight Green Serum (Serum comes in the full retail size!!!). 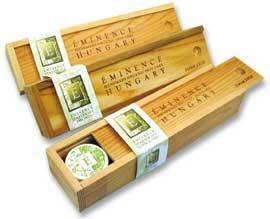 Description: Exclusive hand made wooden tube is filled with your favorites. Benefits: Creates kissable, smooth skin! 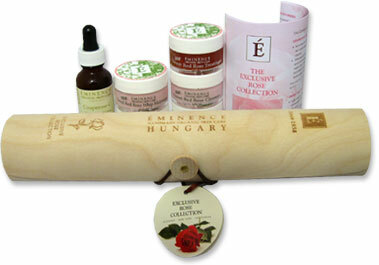 Description: This beautiful collection of five fragrantly delicious organic Hungarian rose products are housed in our signature handmade wooden gift box. Active Ingredients: Sweet Red Rose Cleanser, Rosehip and Maize Exfoliating Masque, Sweet Red Rose Treatment, Rosehip Whip Moisturizer and Sweet Red Rose Whip Moisturizer. Active Ingredients: Lemon Cleanser, Rosehip and Maize Exfoliating Masque, Pumpkin and Orange Masque, Naseberry Treatment Cream for Day, Linden Calendula Treatment Cream for Night. Active Ingredients: Rosehip and Maize Exfoliating Masque, Seven Herb Treatment Masque, Sour Cherry Masque, Stone Crop Masque, Rosehip Whip Moisturizer for Day and Night. Ask our skin care specialists for advice in creating custom home care especially for you and your skin's specific needs. To contact our spa concierge for help in customizing your selections, click here.